We retrospectively analyzed risk factors and outcomes of individuals ≥ 60 years of age presenting to the emergency department with a clinical diagnosis of ARI. 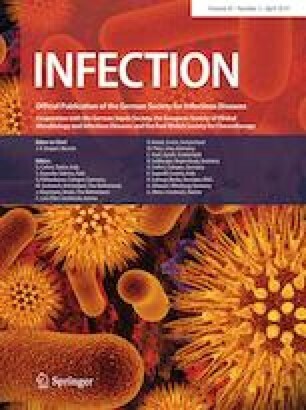 Of 276 individuals in the study, 40 had proven viral infection and 52 proven bacterial infection, but 184 patients with clinically adjudicated ARI (67%) remained without a proven microbial etiology despite extensive clinical (and expanded research) workup. Patients who were older, had multiple comorbidities, or who had proven bacterial infection were more likely to require hospital and ICU admission. We identified a novel model based on 11 demographic and clinical variables that were significant risk factors for ICU admission or mortality in elderly subjects with all-cause ARI. As comparators, a modified PORT score was found to correlate more closely with all-cause ARI severity than a modified CURB-65 score (r, 0.54, 0.39). Interestingly, modified Jackson symptom scores were found to inversely correlate with severity (r, − 0.34) but show potential for differentiating viral and bacterial etiologies. Modified PORT, CURB-65, Jackson symptom scores, and a novel ARI scoring tool presented herein all offer predictive ability for all-cause ARI in elderly subjects. Such broadly applicable scoring metrics have the potential to assist in treatment and triage decisions at the point of care. The online version of this article ( https://doi.org/10.1007/s15010-019-01299-1) contains supplementary material, which is available to authorized users. ASB received funding from the Eugene A. Stead Foundation and the Infectious Diseases Society of America. JS is funded through an NIAID-sponsored T32 Transplant ID Training Grant. MTM received support through the National Institute of Allergy and Infectious Diseases (NIAID), the Veterans Health Administration, the Claude D. Pepper Center, and the PRIME consortium [National Institute of Aging (NIA)]. R Core Team. R: A language and environment for statistical computing. R Foundation for Statistical Computing 2018. https://www.R-project.org. Accessed 1 Mar 2018.